A Tonk's Tail... err, Tale...: Monday 2.0: "Love Saves the Day" Arrives! We learned lots here! And as our mom loves to read and she loves cats, she'll have to check it out. We've seen Homer on the innernets but didn't know he had a book out cause we live under a rock. We'll look for it at the Kindle bookstore. I wonder if it will be available at midnight. Just saying! Nook!?! Wes can gets it on our Nook!?! Me is off to see! We're like Oui Oui--we know about Homer from Innernetz videos and stuffs, but we did not know he writed a book. 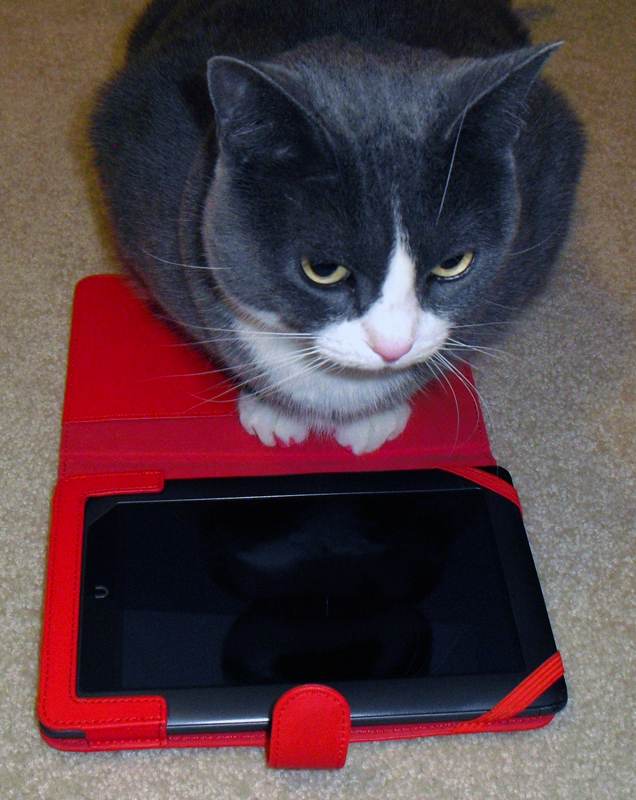 Well, I guess strictly speaking, his Human wrote it for him, but still.... We'll check it out! Mom didn't know that about the first week of a book being on sale. Good reason to buy the book now rather than later. We sure wish Gwen the very best! Homer too, of course. We wish Gwen the best of luck. Paws crossed. Have a terrific Tuesday. 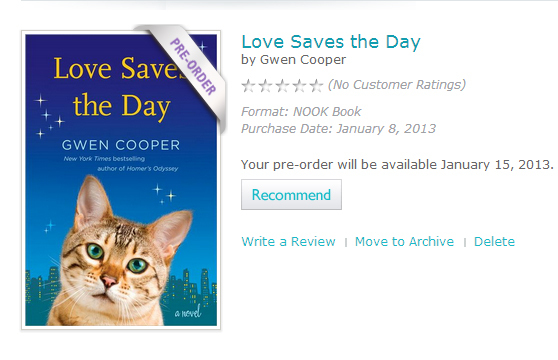 Hope that Gwen will sell lot of books the first week ! Oooooh, have to get mom to order the book. The only question is whether to get it on the nook or in the flesh (OK, paper). The nook app for iPhone wasn't very good. Does anyone know whether it's any better for the iPad? Purrrrrrrrrrrrrrs. 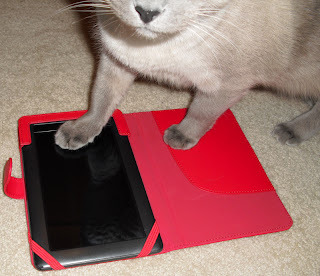 Oh, and I love the red tablet cover. Red is mommy's favorite color. She even painted her workroom red (she loves her cozy dark red workroom). Purrrrrrrrrrrrrrs.